I just realized that I never posted the second two large stars. Oops, I don't have a picture of those two yet, so we will save those for another day. Meanwhile, I have six of the smaller stars that measure roughly 6 1/2" square. Here is a photo of them placed haphazardly on my sewing table. Six smaller blocks - and the "parts dept." in the background. Yes, there they are - strings and all. Ha ha. I don't worry about cleaning them up and getting them ironed really neatly until later in the process. I did sit down and figure out a layout in Electric Quilt. 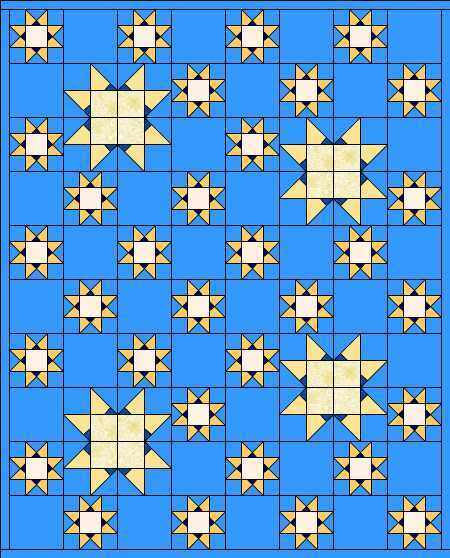 I had to choose a star block and then replicate one fourth of it to make the bigger star blocks fit in the grid. Stand-in stars used in the layout. Mine will be wonky and scrappy. 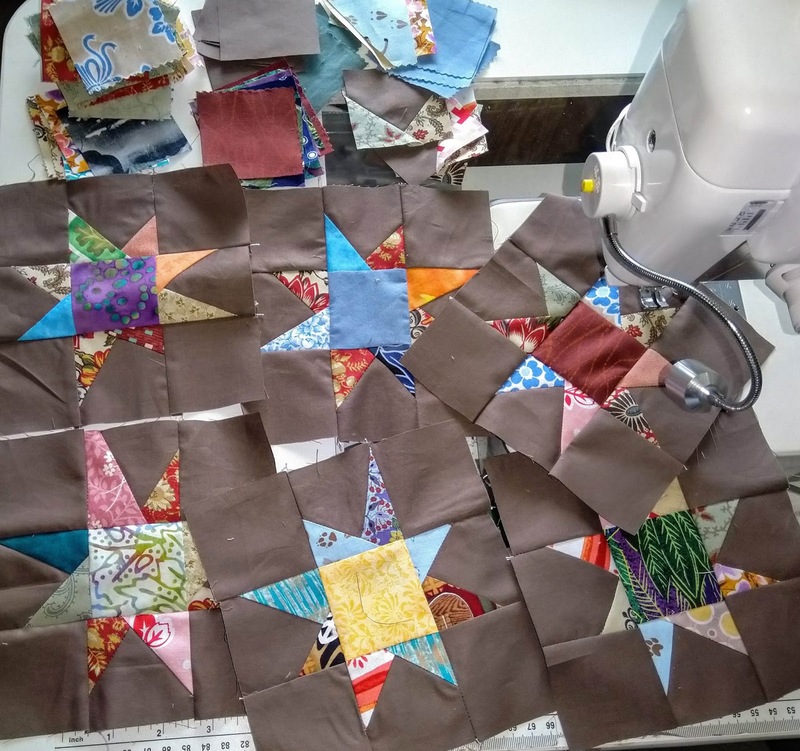 Now I have twenty-six more small star blocks to make for this quilt top. However, tomorrow is the anniversary of the day I came into this world, so I am taking the rest of today and tomorrow off. The only "have to do" is my daily Spanish lesson. Oh, yes, I baked my cake this morning. It isn't much to look at, but it smells like heaven. I made a peanut butter sheet cake and poured a boiled peanut butter icing over it in the pan. Of course, I had to sprinkle some mini chocolate chips on it too. Ha ha. Fortunately it will be shared with lots of family so I won't wreck my blood sugar readings too badly. Have a great weekend, I declare it a holiday! Que tengas un buen fin de semana. Happy Birthday Gene! That is one way to get a cake you like for your birthday. Happy Birthday! Your stars are looking beautiful. I really like the background. I love your wonky stars and HAPPY BIRTHDAY! Love these!!! You are so good! Happy Belated Birthday, Gene. Hope you had a great day and enjoyed that delicious cake with lots of family and friends. Mindlessly making stars reminds me of my string blocks. I’m beyond making a quilt but I just keep making them anyhow. Hippo Birdie To Ewe! When you get this done, it will be so fun...love the stars.... I probably would have saved the whole cake for myself...HA! !